You're probably gonna die alone. Least that's what tradition told you. Come Sunday morning, you best be there in the front row like you're supposed to. Mama's hooked on Mary Kay. Brother's hooked on Mary Jane. Daddy's hooked on Mary two doors down. Just like dust, we settle in this town. Where it stops nobody knows and it ain't slowin' down. We think the first time's good enough. So, we hold on to high school love. Sayin' we won't end up like our parents. Tiny little boxes in a row. Ain't what you want, it's what you know. Just happy in the shoes you're wearin'. Same checks we're always cashin' to buy a little more distraction. 'Cause mama's hooked on Mary Kay. We get bored, so, we get married. We're so bored until we're buried. On this broken merry go 'round. Jack burned out on booze and pills. And Mary had a little lamb. Mary just don't give a damn no more. 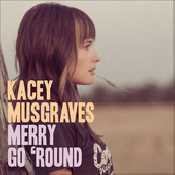 - Álbum "Merry Go 'Round" del año (2012)	.